Located in the beautiful city of St. Petersburg, Florida, USA. Stop by and see all the amazing new products coming in daily. 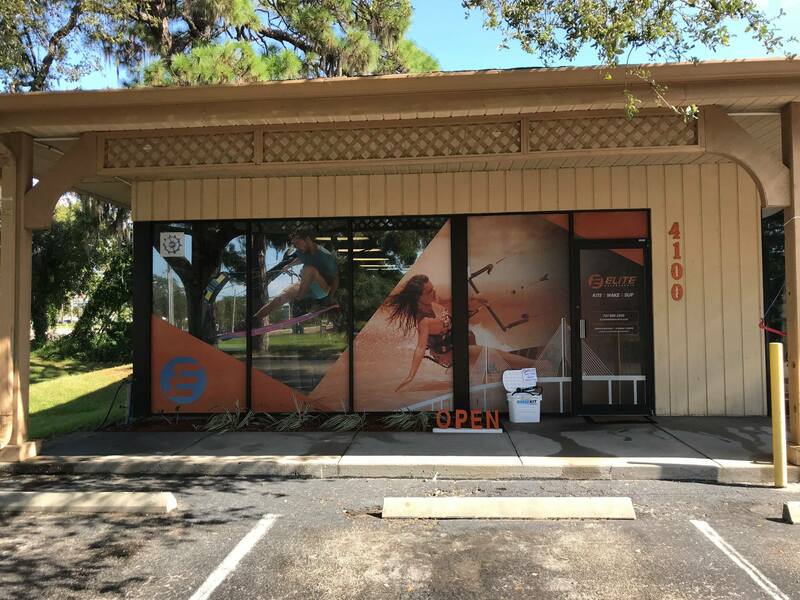 If you are taking lessons from us in the Tampa Bay area, our shop is only a 10 minute ride from most of our teaching locations. 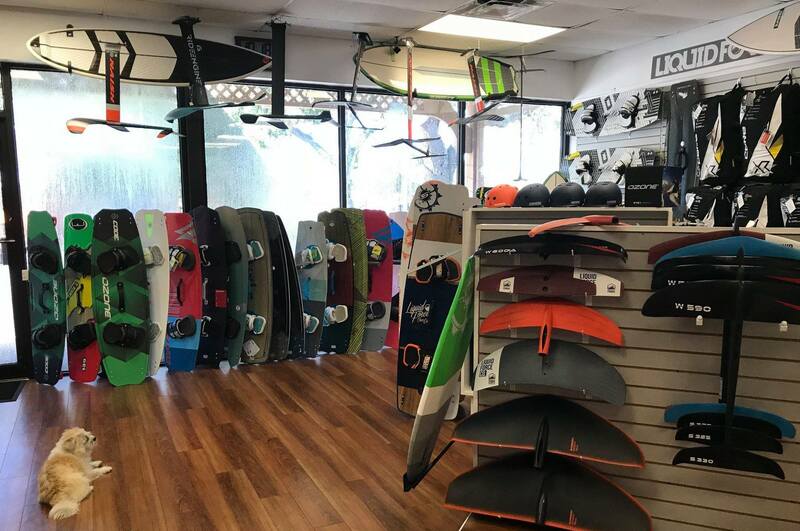 We stock a huge selection of boards, kites, accessories, and more. With our professional team we can help you select the best options for you. With demos and lessons, we need a fleet. 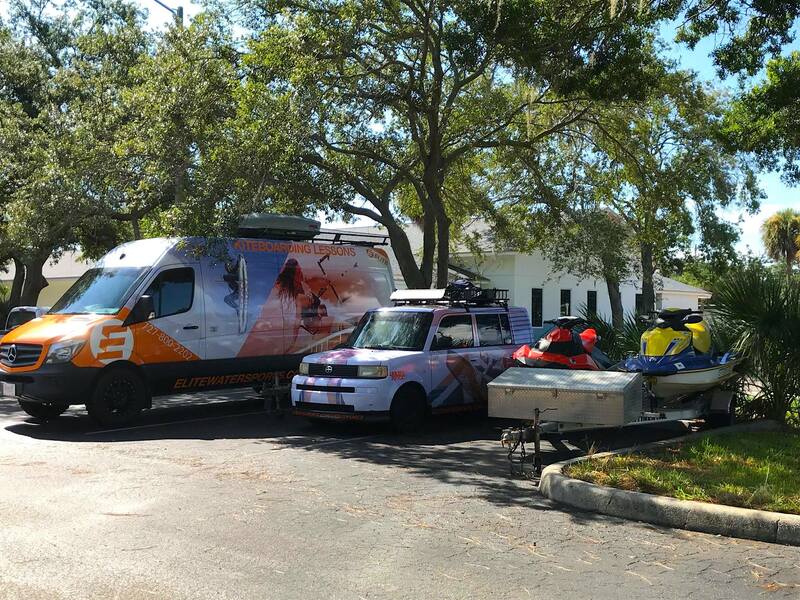 Tampa Bay's premiere watersports shop needs a fleet to run. With our vans and demo cars we are always out and about. Teaching kiteboarding lessons is our main focus. We also do wakeboarding lessons, Efoil rentals, and demos all around town. Jet ski support is a must for safety so, we always have them in-tow. Plenty of parking in front of an easy entrance. Lots of shade from our oak trees to help keep your gear cool in the car. We are family owned and operated. Through the years we have learned a lot. This helps us keep track of the details and not lose sight of our mission. Lined with all the best watersports gear, Elite Watersports stocks all the essentias needed to have a great day on the water. 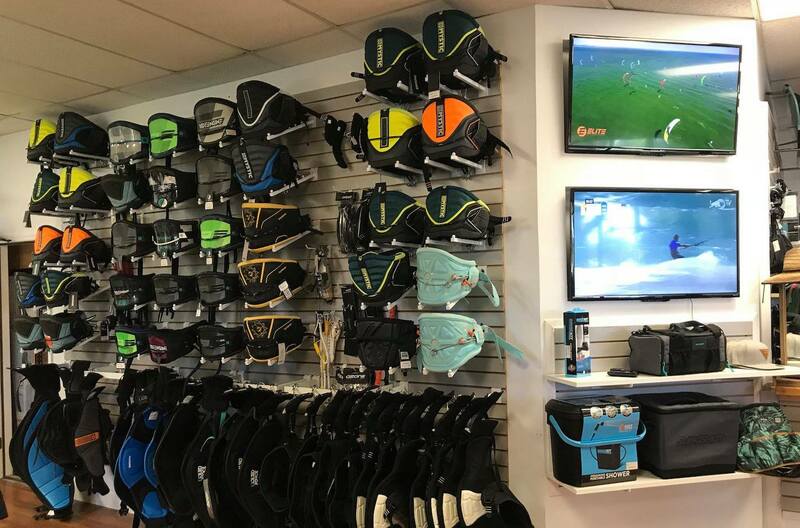 Kiteboarding gear includes kites, control bars, harnesses, and boards. 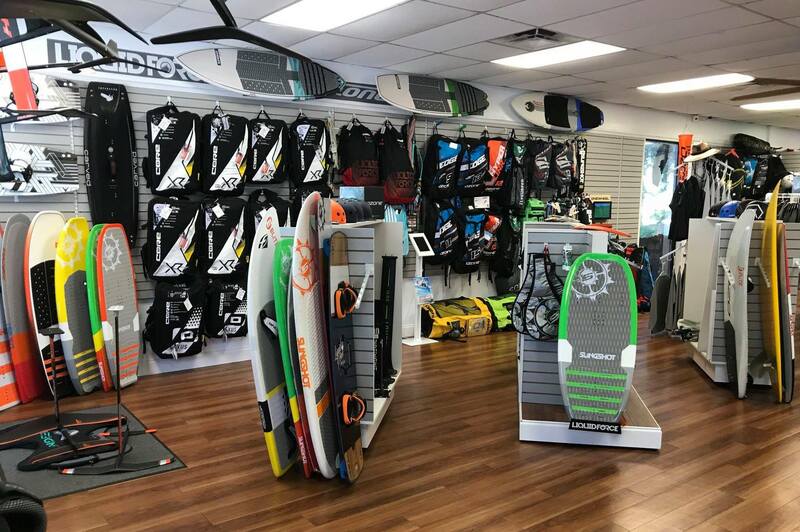 We also stock boat tubes, wakeboards, and more. Swing on through and we can show you what is new and exciting. Our newest edition is Efoils. Every board is different. Let us walk you through what makes them different and why. We will help you make the best decision for the ride you desire. Harnesses are like shoes so we have many in stock. That way, you can try them on and see what fits best. 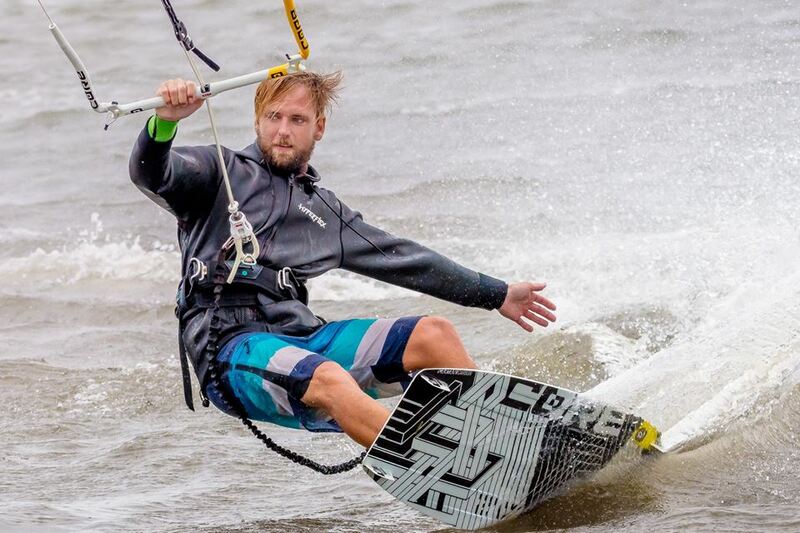 With our kiteboarding simulator you can hang back and test them out. 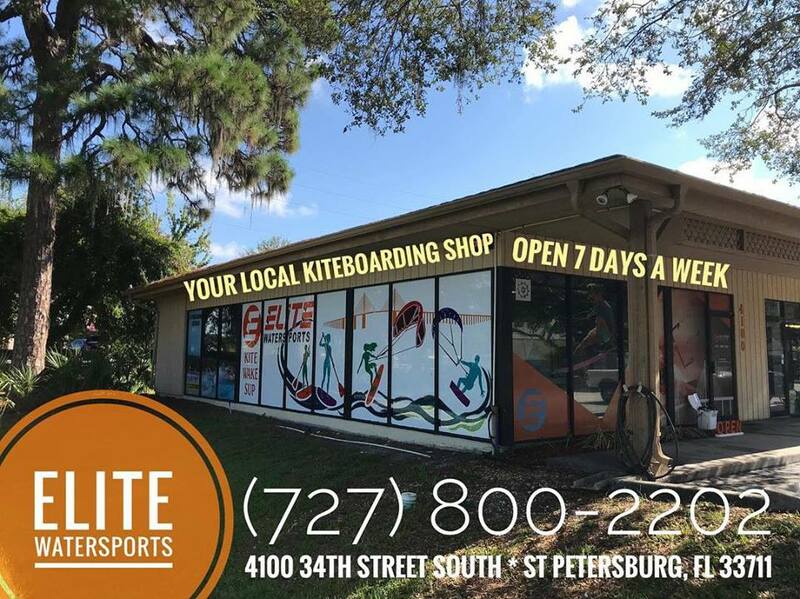 Over 100 kites in stock. Our brands: Core, Liquid Force, Flysurfer, Ozone, Slingshot, and Naish. 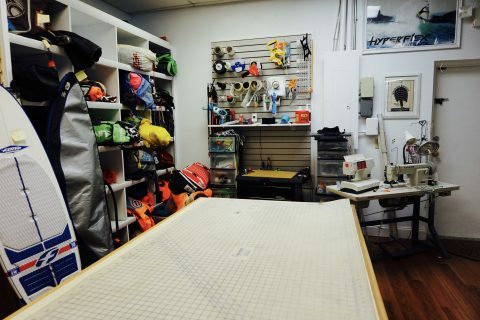 Our team is trained to repair all brands of kites. We also do custom control bar tuning and rebuilding. Sewing of the smallest rips to the biggest tears. We can also do full bladder replacements if you spring a leak. Our team is composed of kiters. We go out daily and try the gear so that we have real, hands-on experience with the products. We have all been in the watersports industry for the majority of our lives and only want to spread our knowledge. Elite Watersports host huge events. 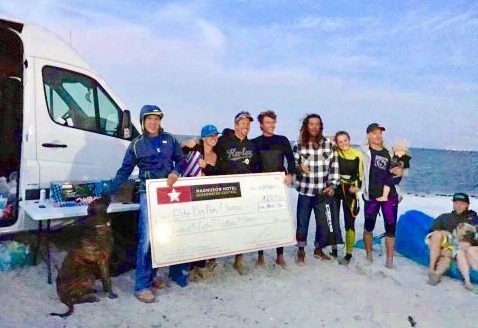 Big air competitions, foil regattas, and beach clean ups. We support our local community in huge ways.